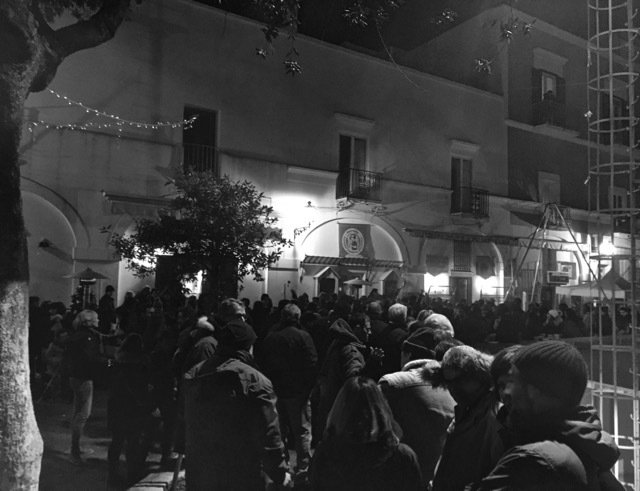 We rang in 2016 on the island of Capri and that was pretty terrific. For 2017 we wanted to welcome what is likely going to be a turbulent twelve months a chill vibe in a place we loved. 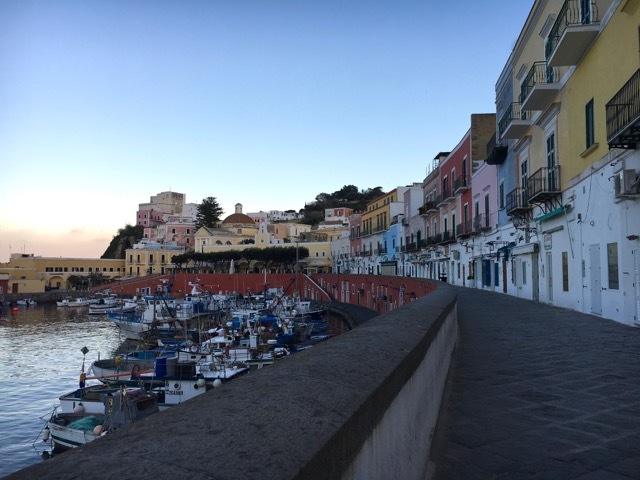 We considered just staying at home in Rome or maybe going up to Venice but in the end made the bold choice to head to our favorite summer destination and see what winter in Ponza was like. Now you know I love a place in the off season and Ponza is no exception. I really enjoy the slightly desolate calm. Off season travel is not for everyone. You have to be a little more flexible, bring lots to read and have back-up snacks. Just in case. If you are game I highly suggest a winter visit to this beautiful and charming island. 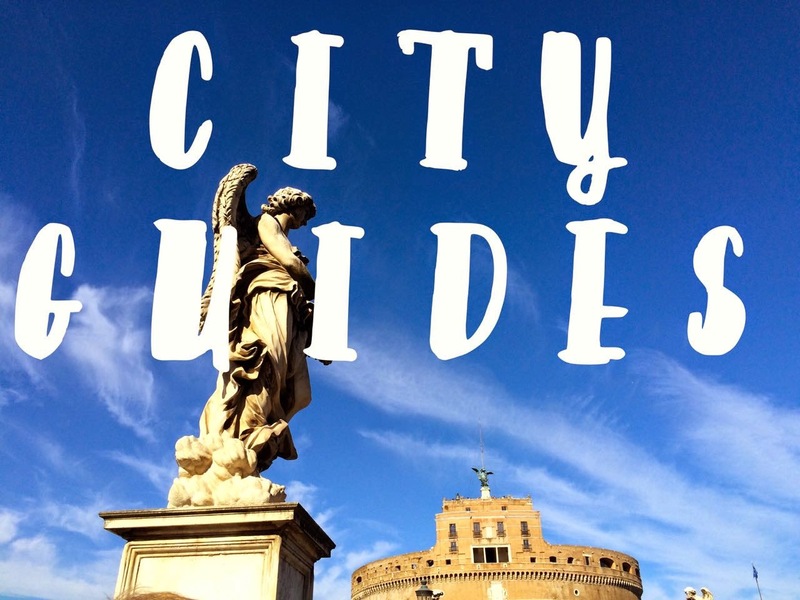 Here is my advice on what to do and where to eat when you get there. 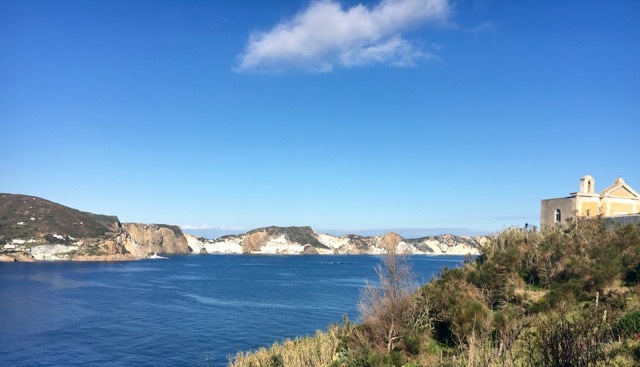 In the summer there are multiple points south of Rome where ferries leave for Ponza. In winter your only choice in Formia-Gaeta where three boats depart daily. Weather can be a factor. We had a lengthy train delay so plan with contingencies and be flexible. Ponza Travel has daily updates on boat times and weather conditions. In summer it is too hot do much more than lounge under an umbrella or on a boat and swim at least every thirty minutes or so. 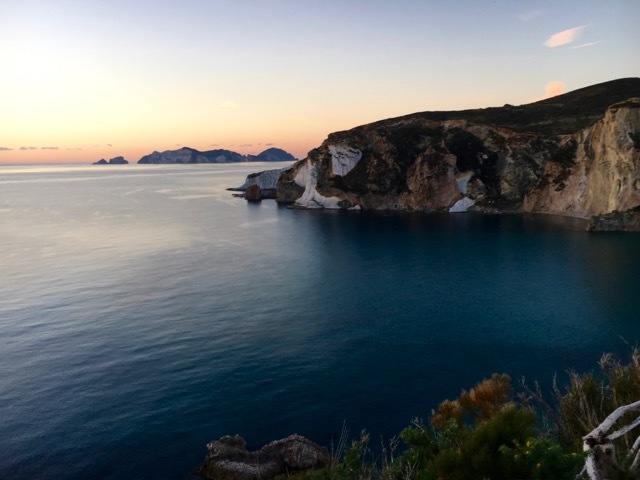 In the off season there is so much more to see than the gorgeous beaches in Ponza. 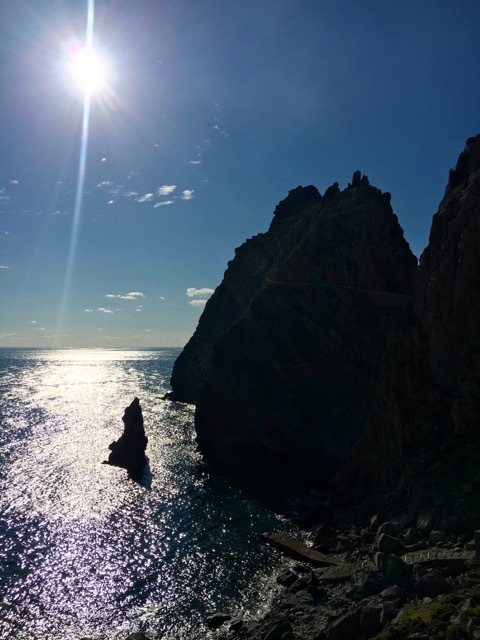 On this trip we decided to explore the two furthest points on the island on foot. We had perfect trekking weather with clear skies and temperatures so mild we had to take our coats off. We set out late morning and took a bus to the very end of the line just past Cala Fonte. There is a large sign that marks the trail head for Punta Incenso. This is the easiest walk on the island and takes about an hour. 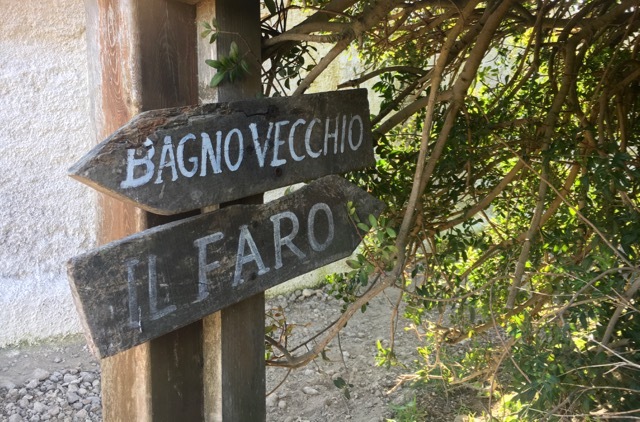 Just follow the well marked path up for an incredible view of Palmarola on one side and Gavi and Zannone islands on the other. Check with the bus driver to time your return trip back. Unfortunately the actual lighthouse, which was manned until the mid 1970’s is abandoned and locked but the two hour walk which is mostly well marked is worth the effort. There is a small beach at the end where you can swim in the warmer months or if you are a polar bear. Mark and I celebrated our wedding anniversary with this hike on an unseasonable cool July morning. Trek through Mediterranean scrub to the Roman era necropolis carved into the cliffs. There are some steep parts to this trail with very necessary ropes places along the way. This PDF by the Comune of Ponza’s PDF has details of the paths. There is just enough open that with some planning you are sure not to starve, but there is obviously not the variety you would find at the height of the summer season. Sandwiched in between the Mage Circe and Bar Tripoli this family run restaurant completes the tryptic. In summer we slowly move between the three places ending wth dinner here. I usually order the carbonara made with local prawns in place of pancetta. Classics like the spaghetti alle vongole and marinated anchovies are also delicious. During our winter visit we ordered take out pizza and brought it back to our rented villa and watched Wes Anderson's The Life Aquatic with Steve Zissou which was filmed in Ponza. The evening of new years day we did not have much hope that anything would be open for dinner. We stopped at Bar Tripoli to ask advice and they called around and booked us a table at this old fashioned pizza place in Santa Maria. It was a cold and dark January evening but Pizzeria da Luciano was worth the walk. 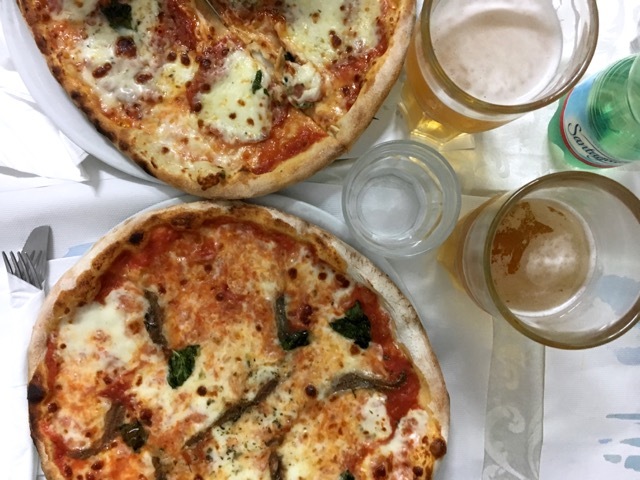 Neapolitan style pizza and a cold beer is always a good idea. In summer there is a large outside patio on the beach. In summer we come here for take out dinners of roast chicken and eggplant parmesan to enjoy on our rented villa terrace. In winter we tried traditional Ponzese lentil soup and pizza bianca filled with greens or cheese and ham. This bar (with great wifi) was open for limited winter hours for a late morning coffee or pre-dinner negroni. 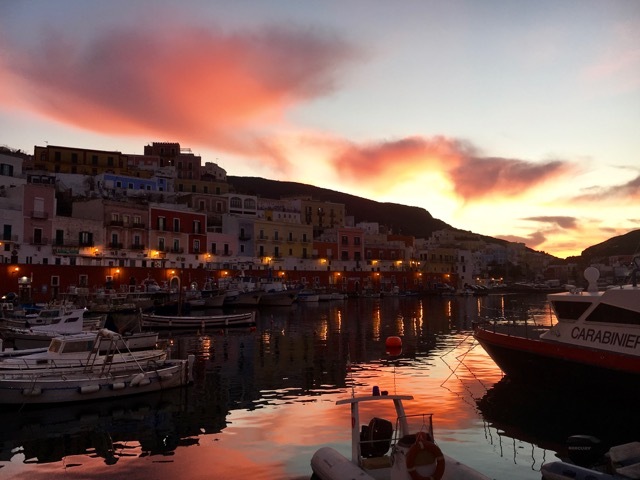 This bar is the year round heart of Ponza. The best part of visiting in winter is that there is always a table available, something that can be near impossible in summer no matter the time of day. The freshly made to order sandwiches here are terrific, but the real surprise is the extensive selection of English sweets that are available. 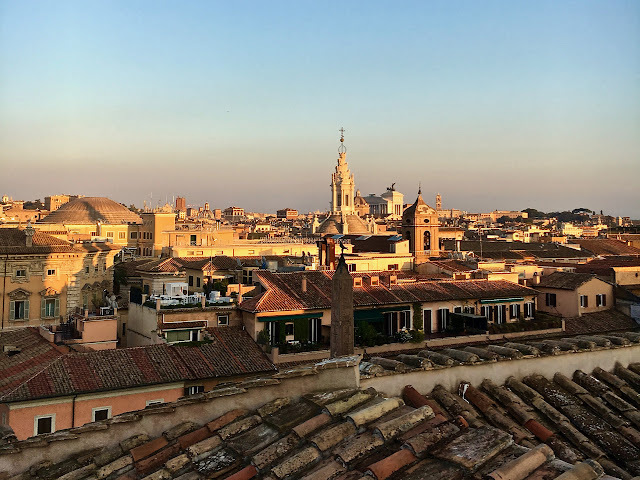 We filled out suitcase with bags of Malteasers and Cadbury Flakes to take back to Rome. 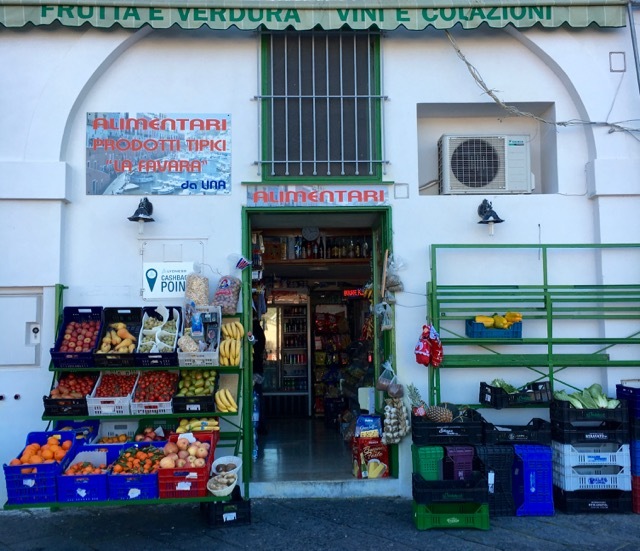 We stock up at this friendly grocery shop with milk for morning coffee, fresh Pontine mozzarella, bread, prosciutto and local wine. I bring back bags of dried lentils, chick peas and oregano from here to give as gifts. If you want to know more about Ponza, like how to get there, where to stay and where to eat download my ebook, Ponza Travel Essentials. 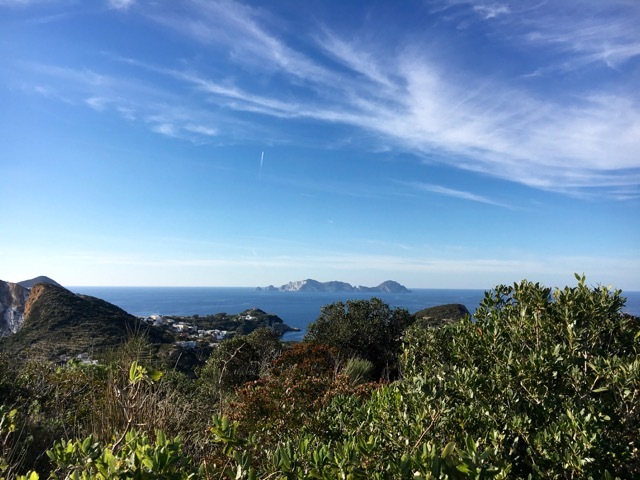 Cesare from Visit Ponza organized our cozy stay at the beautiful Villa Faro (where we had also stayed last July) and a spot at the islands very relaxed and festive new years eve celebrations. Looks beautiful! Top of my Italian travel to do list this year. 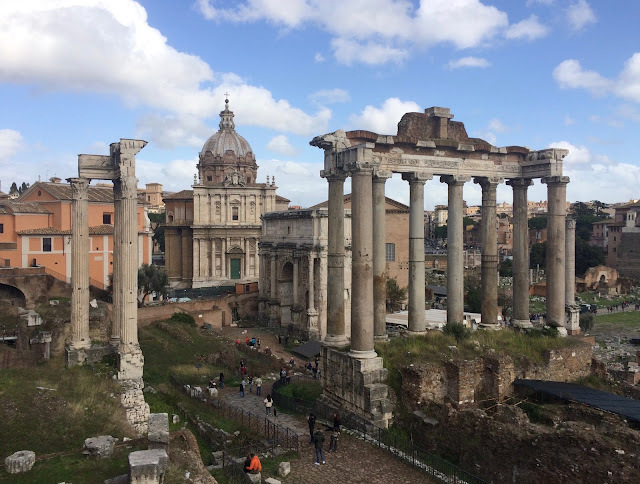 Who knew there could be such natural beauty so close to Rome. I must plan to extend one of my stopovers when flying out of Rome for this. Off season brings the most happy surprises. 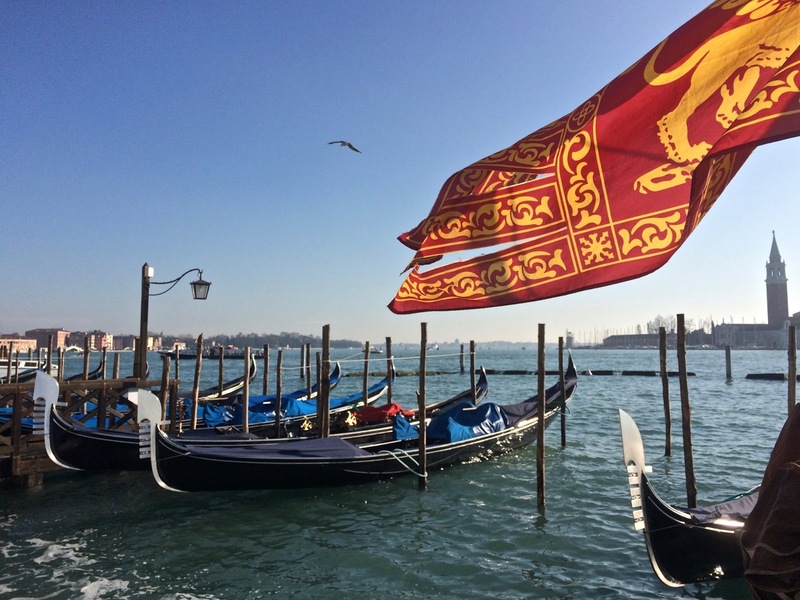 We have been to Venice in late fall and it is even more magical than usual. 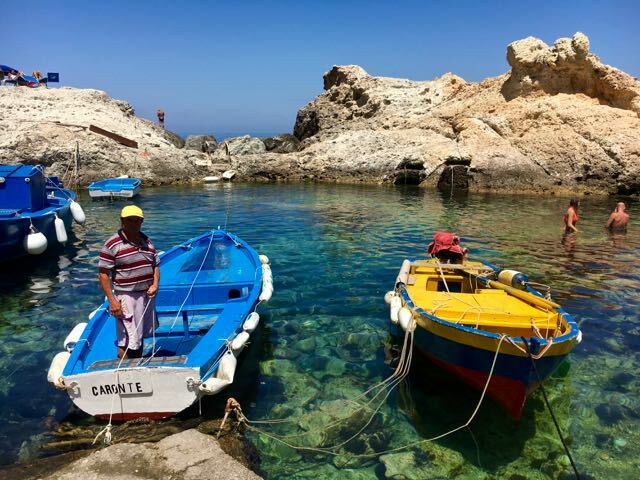 Your winter Ponza trip sounds like a cozy dream... especially the part about takeout pizza and Wes Anderson movies! 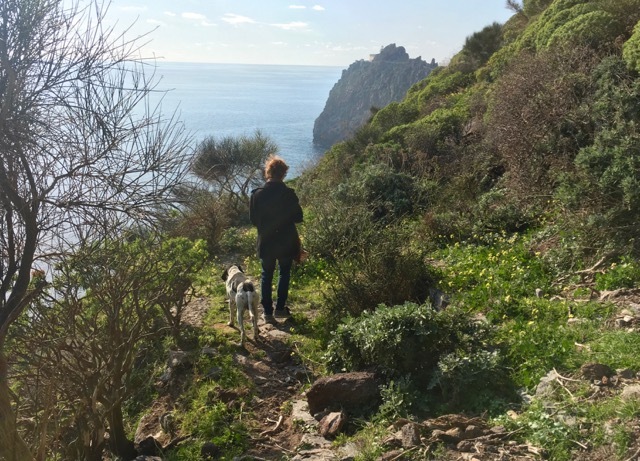 Having been to Capri and Elba for five days each, we were planning a visit to Ischia for five days in September. Might Ponza be a better choice? We were thinking about going here of Easter and these are some fabulous tips. Thanks Gillian!